To graphically demonstrate the benefits of 'Hi-Float' we carried out a little experiment. But before we get to the demo, let's first explain the product. 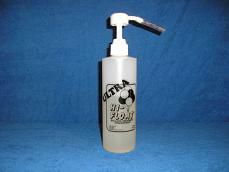 There are three different types of this product, but we recommend using 'Ultra Hi-Float', which increases the floating life of latex balloons by 25 times on average. For example: an 11" latex balloon will normally float for 12 to 24 hours. If treated, the same balloon will stay up for 1 to 4 weeks. Flying times vary greatly depending on factors such as the quality of the latex balloons, temperature, humidity, altitude, etc. How does it work? 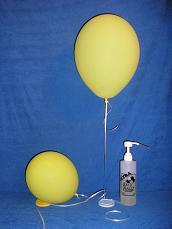 It's injected into the latex balloon using the product pump dispenser (as shown in the video below). When it dries inside the balloon it forms a barrier coating which helps hold in the helium. 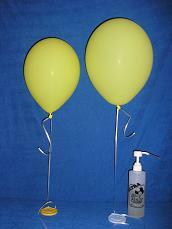 We took two identical 11" standard latex balloons. 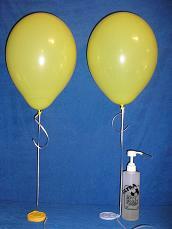 The left balloon on the pictures below was untreated, the right one - next to the bottle - was treated. Both balloons are filled with the same amount of helium. About 10 hours later the untreated balloon had shrunk considerably. After 24 hours the untreated balloon had dropped. Apart from oxidization, the treated balloon was still floating and had no noticeable decrease in size. In total, the treated balloon stayed up for 5 days. Treating your balloons with this product is indispensable if you want to be sure that your balloon decoration looks great throughout your whole event.